1934. 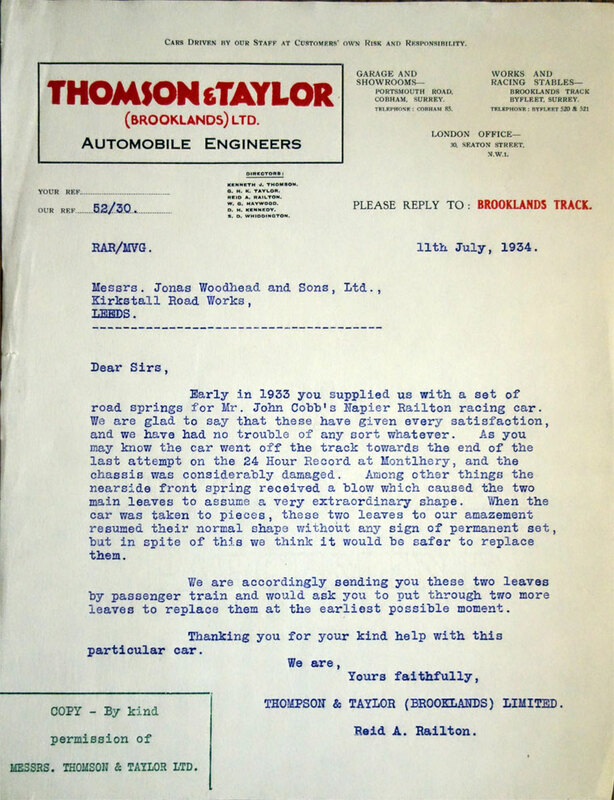 Letter written when working for Thomson and Taylor (Brooklands) to Jonas Woodhead and Sons. Reid Antony Railton (1895–1977) was an automotive engineer, and designer of land and water speed record vehicles. Educated at Rugby School and Manchester University. 1917 Joined Leyland Motors where he worked with John Godfrey Parry Thomas on the Leyland Eight luxury car. 1922 Left Leyland to set up the Arab Motor Co where he was chief designer. Only about twelve cars were built, of which two low-chassis cars survive. One is in the Isle of Man and the other one (Chassis number 6, engine number 10, registration UW 2) is now in Austria having been rebuilt and rebodied by David Barker in the early 1990s. In 1927, on the death of his friend Parry-Thomas, Railton closed the Arab factory and moved to Brooklands working for Thomson and Taylor becoming their Technical Director with responsibility for John Cobb's 1933 Napier Railton car which took the Outer Circuit record in 1933 and Sir Malcolm Campbell's Bluebird Land Speed Record cars of 1931 to 1935. His greatest achievements were probably designing the Railton Mobil Special car with which John Cobb set the Land Speed Record at 394.7 mph in 1947 and designing the E.R.A. racing cars built in 1933-1934 at Thompson & Taylors at Brooklands. He also tuned the Hudson chassis used on the Railton car, named after him. 1933 Associated in a small way with the design of the Railton Cars vehicle. As well as cars he designed high speed boats including the jet-powered Crusader in which John Cobb was killed in 1952 while travelling in excess of 200 mph attempting to break the Water Speed Record. In 1939 he moved to California to work for the Hall-Scott Motor Company. He died in Berkeley, California in 1977 at the age of 82.